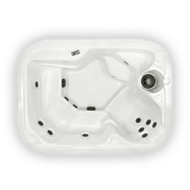 The popularity of the Value Spa, allows us to pass on the savings achieved by volume manufacturing and offer the very best “value” in a Canadian made Hot tub. The Après ski spa offers seating for 6 bathers. 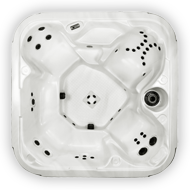 The two powerful jet pumps provide a strong water flow to jetting strategically placed throughout all six seats. The placement of each jet has been considered to provide flexible muscle massage. The Snowbird spa offers seating for 4-5 bathers. The two powerful jet pumps provide a strong water flow activating a large number of smaller but intense jets located to provide full body stimulation. 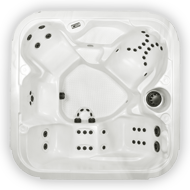 The Quartet offers seating for 4 bathers making it perfect for a young family. 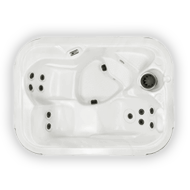 The Duet offers comfortable seating for 2 bathers. The convertible 240v/115v electronics make it perfect for a cabin or vacation property.